I (Akasha) am a teacher at home (MN, U.S.A.) as are many of my friends. 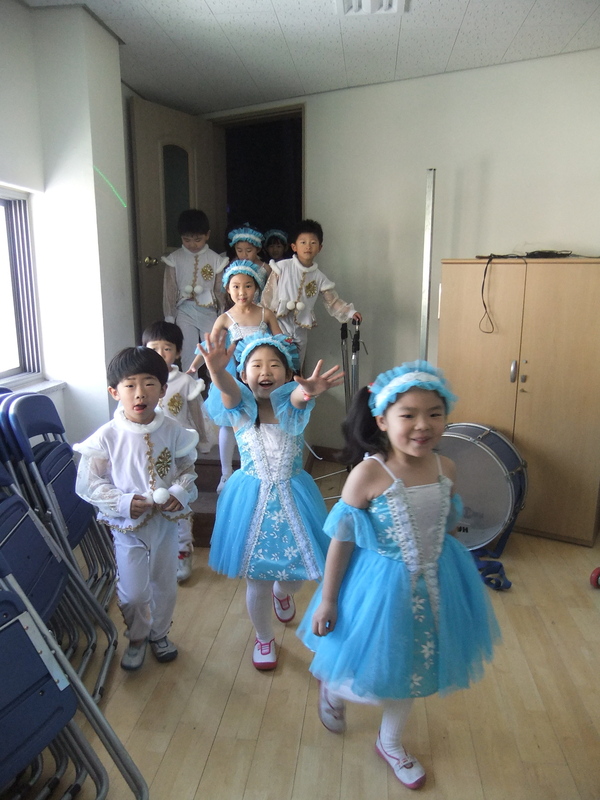 This post is intended mostly as a comparison of teaching in Korea to teaching in our public schools. Things are very last minute here. Even after a year, I was struck by the last minute approach when the school year changed. I think that we’ve mentioned before that teachers change schools every four years. They can only teach in the same province for eight years. That means in a 20 year teaching career you will teach in 3 provinces. 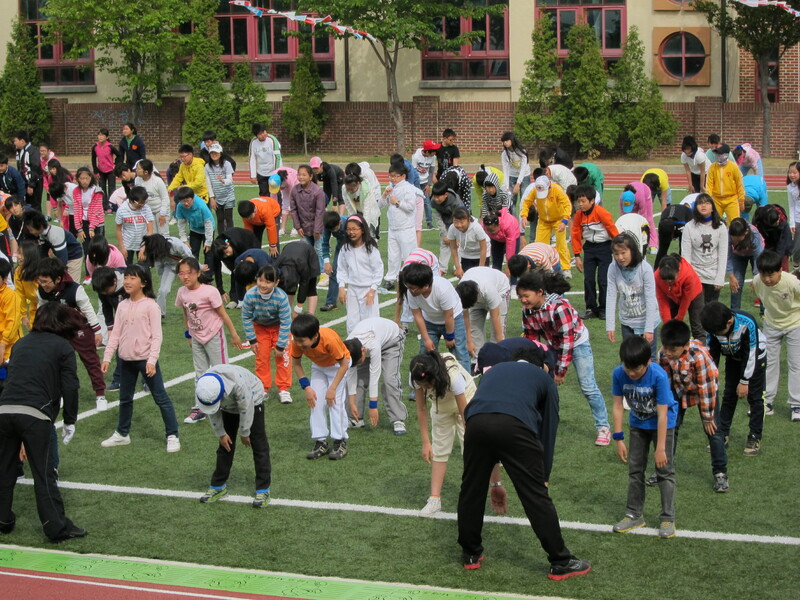 The school year starts nation-wide the day after Korean Memorial Day. This year it started on a Friday. The Monday before the school year began, the teachers were informed what schools they would be teaching in (and therefore what towns). On the first day at the new schools, they learned what grades and subjects they would be teaching. Then, the teachers went up by team to select envelopes. The envelopes had student rosters in them. They drew their rosters at random. 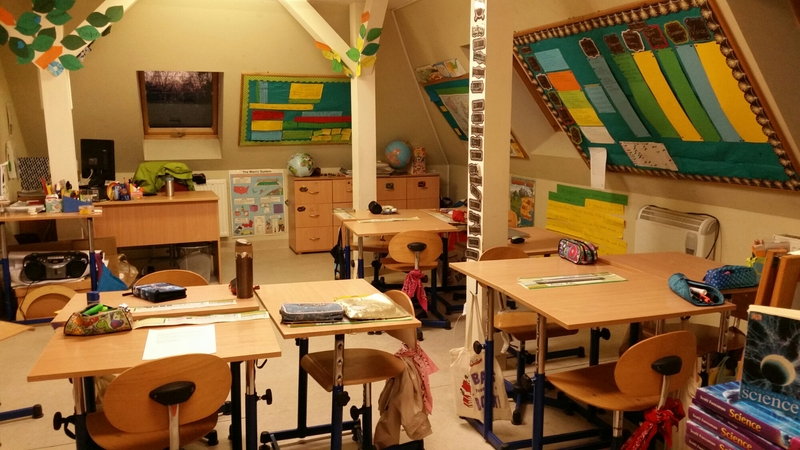 That is VERY different from home where we begin planning the elementary class rosters the spring of the previous school year, trying to get the right blend of personalities and academic strengths in a room. To clarify: on Monday they were assigned to their school, drew student rosters, and were assigned rooms. Wednesday was a national holiday. School started on a Friday. On Friday the school was still a mess. Desks were in the hall, and all the old teacher’s stuff was up on the wall. Looked like a tornado had just passed. Crazy. The buildings here have a slightly different layout, more open sided like a California school (think 90210.) My school has 3 buildings. B Building: Kindergarten (optional 1 classroom + kinder bathroom), 1st, 5th and 6th grade. There’s also a classroom just for violin lessons. The odd part is that students return to school for one week in February for graduation week. At my school we didn’t teach any content, they didn’t have any electives, but everyone was here for a week. On Friday, K-5th grade comes to school for 2 hours, then leaves. 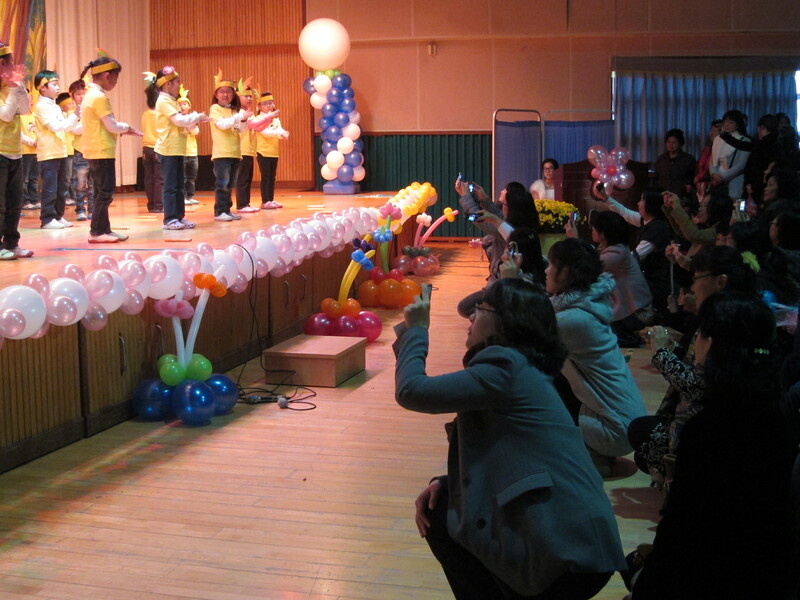 The 6th grade held a graduation ceremony, then the teachers went out to lunch. The day officially starts at 9, but by 8:30 the crossing guards have left. Yup, most kids get to school about an hour early. Classes start at 9 and are 40 minutes long. There’s a 10 minute break between each class, but a 20 minute break after period 2. (At Mike’s school, Wednesday’s classes only have a five minute break between periods.) Grades 1-4 only go to school for 4 periods a day. They leave after lunch. That’s right. They eat a free, hot, made fresh at school lunch, then go home at 1pm. Only grades 5 & 6 are in the building after lunch. During the free periods teachers usually go to the lounge, run errands, have a snack/ smoke. Students are completely unsupervised for much of the day, also a big difference from home. PTAs are much more powerful here. They second the text books that the teachers select and can override the teacher’s decision. They come to observe our class (not the admin) in groups of 20+. They are the crossing guards. The parents can change many things in a school. We needed 5 chaperones for a trip. Almost 30 volunteered. We paid to take all 30, even though it was too many adults. Behavior management is very different. Corporal punishment was outlawed just before we arrived. I don’t see teachers hitting students, but I do see them pulling their ears, making them do burpees, making them do downward dog on their knuckles… The most common punishment is to make a student stand at the back of the room. Confucian philosophy affects everything here, and this means that the students are really good at policing each other. I told my 5th graders that if every student did their homework the whole class would get a sticker. The next period only 1 or 2 students were missing their work. The period after that, everyone had their work finished. They made sure that the disorganized kids got it done so they wouldn’t miss out. I just can’t picture my US students policing each other this much. The overall philosophy is that the children should work it out amongst themselves. This has its positives, but does lead to an awful lot of bullying. I would say, anecdotally, that their anti- bullying curriculum is about 10 years behind what I am accustomed to. Like at home, we teachers have a “friendship fund.” It is $30 a month. The money goes to support teacher activities. The entire school gets together on Wednesdays from 3-5pm to play volleyball and eat snacks. Once every few weeks we have an inter school game against three other schools , and once a semester we go out to dinner as a staff. Teacher dinner is always on a Wednesday. 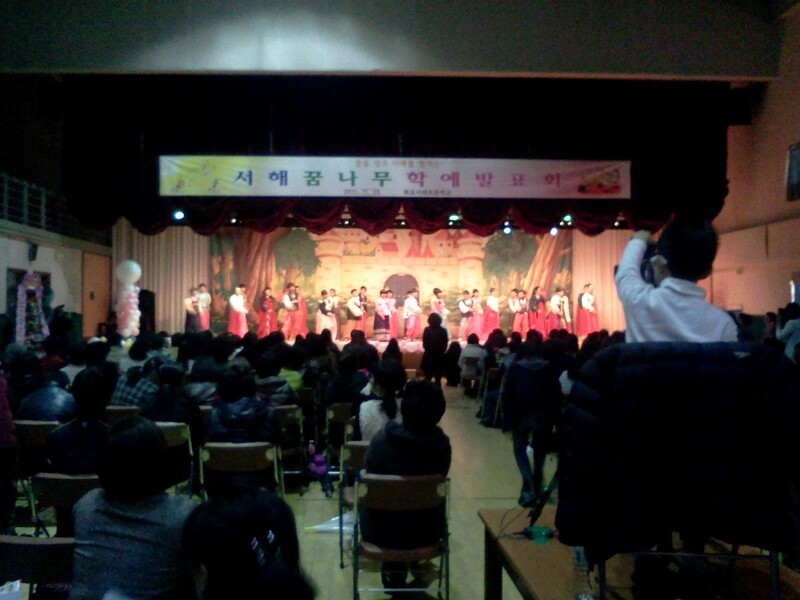 After the dinner many of the teachers go to the Noraebang and sing karaoke style. A bunch go on after to have a snack and drink. Mind you there is a lot of dinking going on at the previous two events. The events usually go on till 2 a.m. Then we have school the next day. Most of this has been said, but the elementary students work hard and play hard. They get here an hour early. They clean the building inside and out. 87% go to private school before/after class. My students play hard. 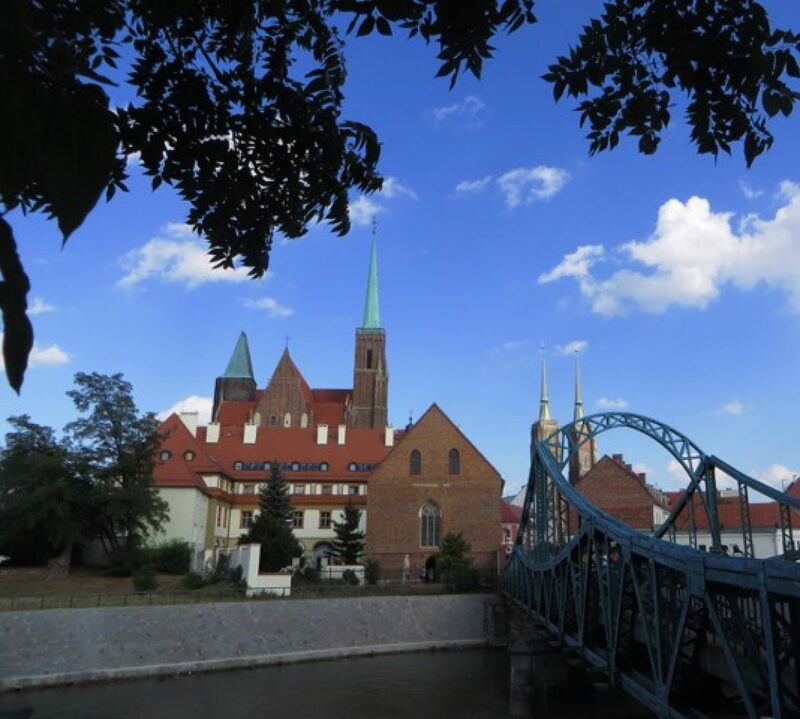 They have two 10 minute breaks, a 20 minute break, and an hour long lunch/free time break. There are no rules and no supervisors during free time. They play soccer in the halls, they play dodge ball without restraint. They climb on displays, out windows, and aren’t being naughty. It’s okay. If they get hurt, it is their responsibility. (Big difference there) They are pretty awesome. I like’em. My favorite time of year is camps so I can tailor make lessons to bring out the fun in them. There are virtually no subs. You might be able to get a long-term sub if you put in a request in advance and one is available. Otherwise a teacher will periodically pop-in to check on your students. Last year a 1st grade teacher had a family emergency and was gone for +1 month. 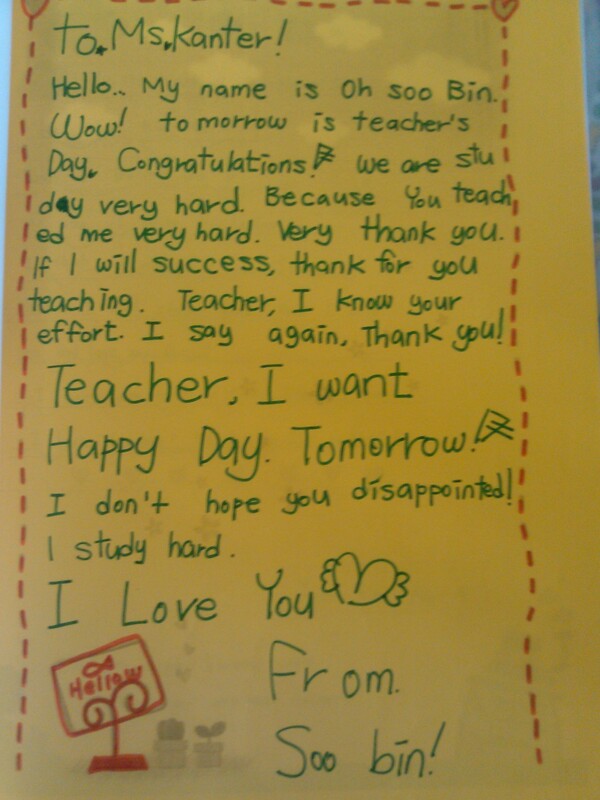 My co-teacher would go for a period a day to check on her 1st graders. There was no instruction in that time. Finally, here is a video I made to give you an idea of what my school is like. Can you count how many “Hellos” and bows I get? I can’t. 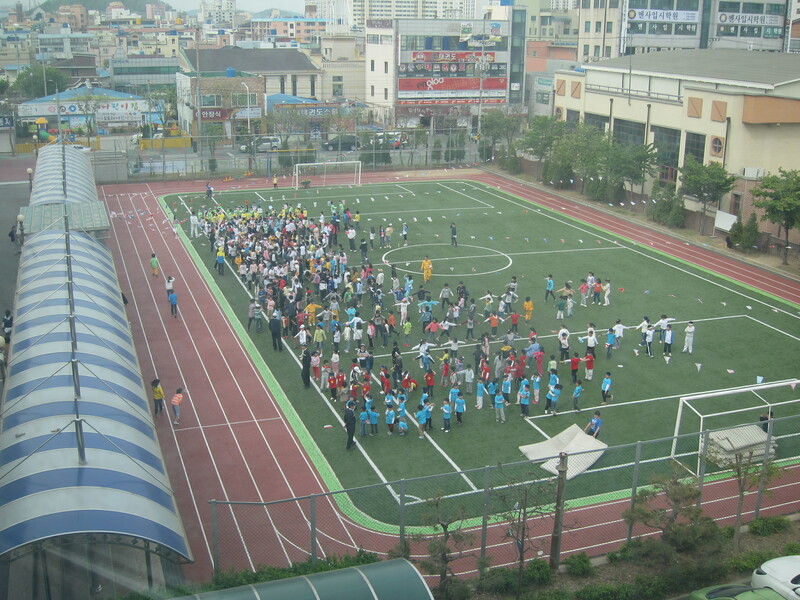 In the morning, all the kindergartners, 1st, 3rd, and 5th graders went out to the field and lined up for a half day of physical activity and healthy competition. They were divided into two teams, the white and the blue, and marched out to the field for opening ceremonies. The national anthem was played over the loudspeakers, then the school song, then a song of memorial. After this, they were led in a pledge I can only assume was for sportsmanship and school spirit. Then, calishtenics. Semi-marshall music was played as the students marched in place, swung their arms, then went through stretches until they were ready for the competition. I watched most of this from the stands. 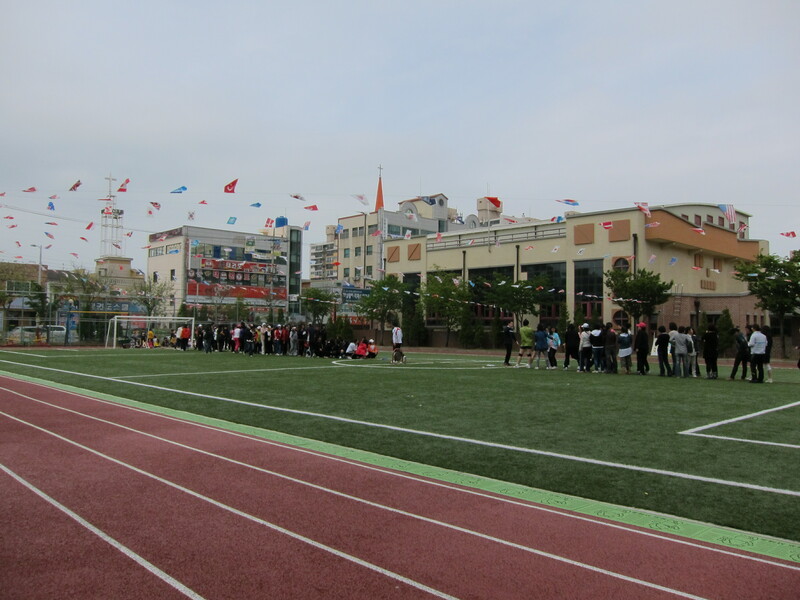 Seohae’s field has a great astroturf field and seating for a few hundred people, but we’re pretty lucky. Akasha’s school has a dirt field, and she tells me by the time lunch came, they’d eaten too much dirt to be very hungry for food. The stands were mostly empty at nine am, but as the morning went on, parents and other spectators began to fill the stands. 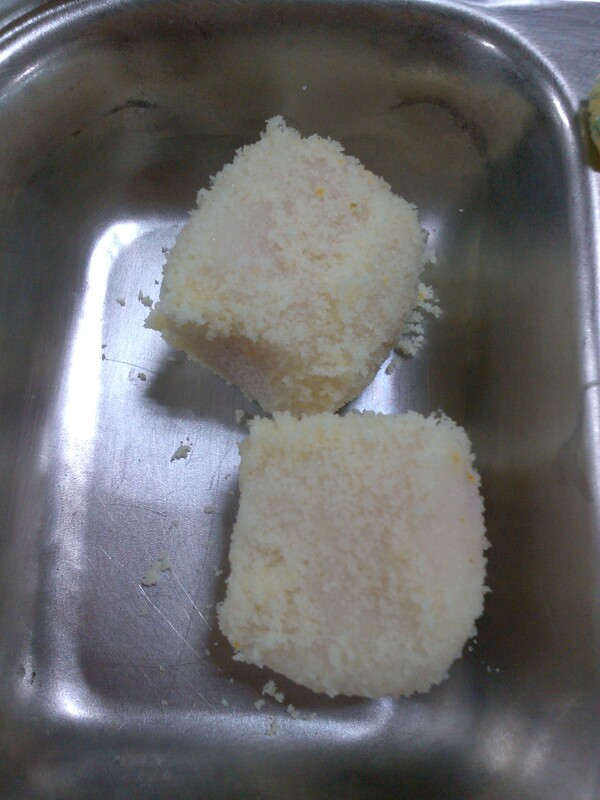 A small cart selling ice cream stood not far from the entrance to the cafeteria. The school photographer, also the school’s “computer girl” as my co-teacher calls her, strolled around taking pictures. First up was the forty meter dash. Easy enough. Then the strangeness and fun began. Students were lined up around the edge of the field, and as I watched, one student was lifted onto the back of each group, and as the other students bent over, she walked on their backs around the edge of the field. It’s something you wouldn’t see in the States due to safety reasons, and this is one of the things I love about Korea – the amount of things that happen that are just plain unsafe. The "Let's crawl through a tube" Relay. 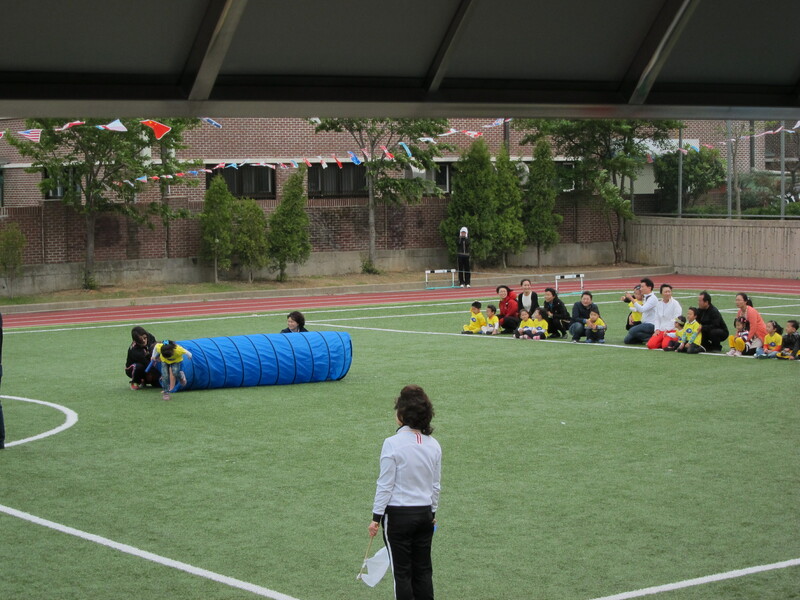 For the next game, teachers scattered bean bags around the field, then carried out a basket on a pole for each team. At the whistle, a crowd of second graders swarmed the field and started chucking the bean bags at the basket for about 30 seconds; then the whistle blew. The teachers counted back the number of bean bags in each basket, and one team was announced as the winner. Games went on like this all morning – students crawled through tubes, did jumps in hula hoops, and turned somersaults on mattresses. One favorite was the students coming in to a circle four at a time and kicking their shoes into big plastic baskets. Then it all ended with a tug of war. First, the fifth graders. I was standing next to the school nurse, who speaks some English. I said, Oh, it’s a tug of war. 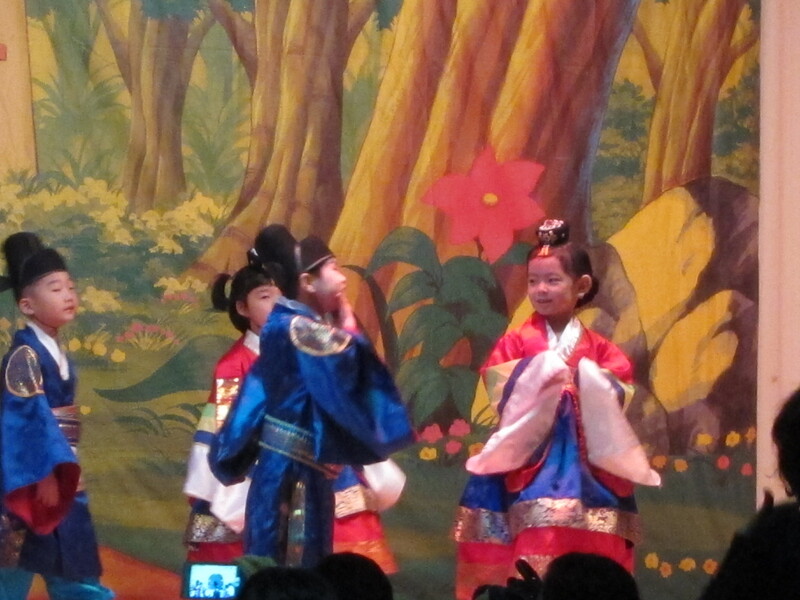 She said Yes it is, then informed me that tug of war was a traditional Korean sport. I nodded politely. The tug of war ended with the parents who had come down to support their children having their own tug of war. This was another thing you wouldn’t see in America – I don’t want to spread malicious stereotypes, but most American parents are either too obese or too competitive for a tug of war to end without a lawsuit and/or death. 2nd, 4th and 6th graders came out for the afternoon session, which had a different set of wacky sports. Somewhere along the line, my students pressured me to join the tug of war. I resisted at first, but being human, I succumbed to peer pressure and ran out to the field and took my position at the end of the rope. I gave all I had, and my team was triumphant! Hurrah! I felt a rush of joy as I returned to my students and gave them all high fives. A few minutes later, my co-teacher asked me to get my picture with the students, and I agreed. Everyone was happy as I moved down the classes till I got to the white team, where I was met with unhappy frowns. It was then I realized my mistake: I’d gone to pull for the blue team, and my victory for them was seen as a crushing betrayal of the other side. I sat down for pictures with some unhappy fifth graders, which I imagine are of me in a sea of stink-eyes, then went back to class. One other real lesson of Sports day: It’s all in fun, until it isn’t. There are so many things to tell you about our new city, I thought it would make sense to start thematically. This entry school, another for home, shopping, pets etc. Overall, we are very happy here. Teaching here is very similar to teaching at home, yet a little different. On Monday our co-teachers were given a 2 hour orientation on what they need to do to help us. 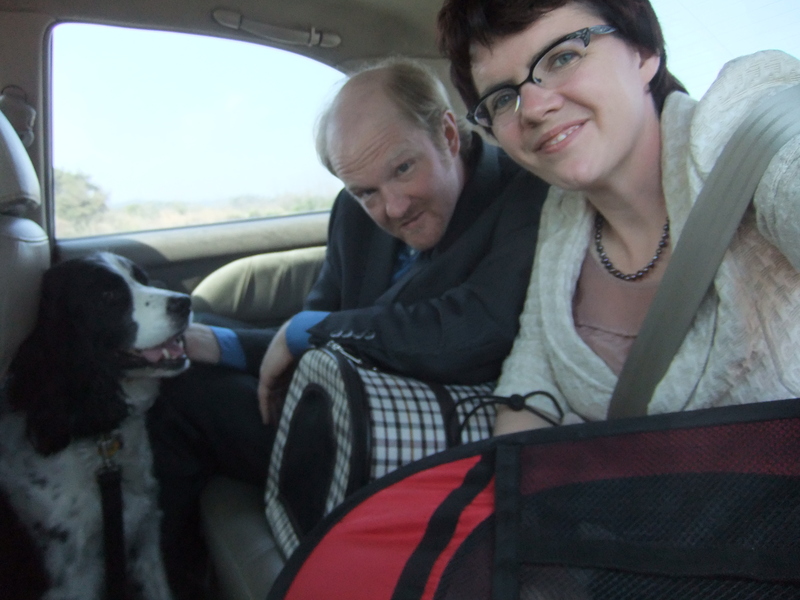 We were then loaded into Ji Yeon’s, Mike’s co-teacher, car. She drove my co-teacher, Mike, Remi, Ching, Clark, and me 1 hour to Mike’s school. Mike then toured his school and gave presents to school administration. 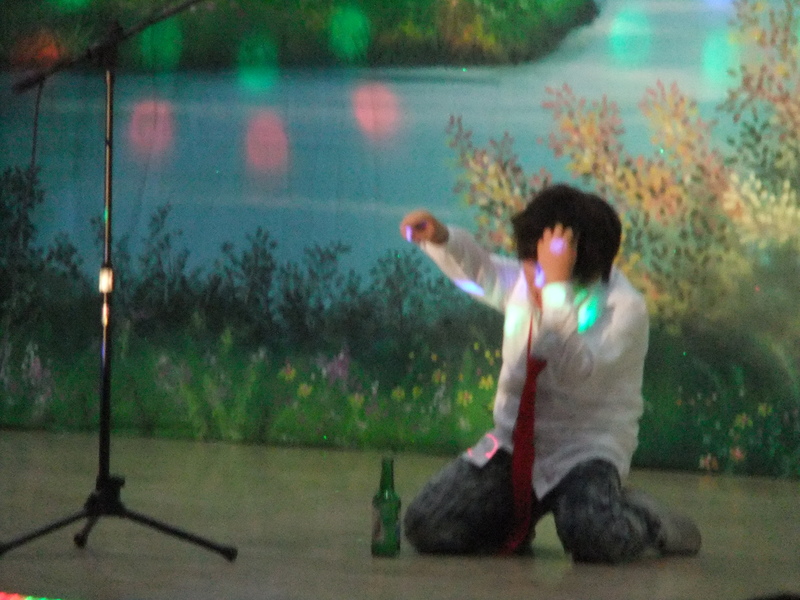 Next, we went to my school and I did the same. We were introduced to the principal, vice principal, and administrators. There was a lot of bowing involved. Then we went home, dropped off the animals, inspected the apt, and made a shopping list. From there we went to the immigration office and applied for our alien residency cards. Then off to the mega-mart, Home Plus, for our starter needs. 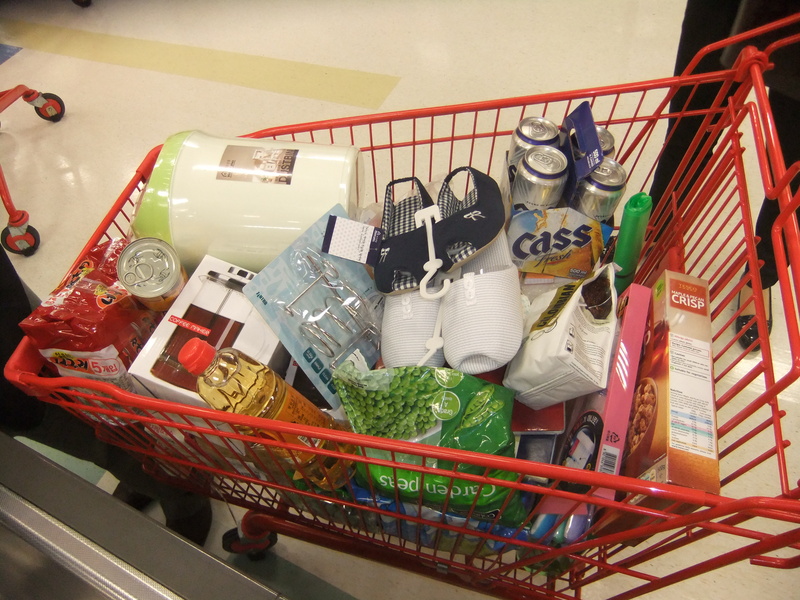 While we were shopping Benji, my co-teacher, leaned over and said “Akasha, we need to hurry. 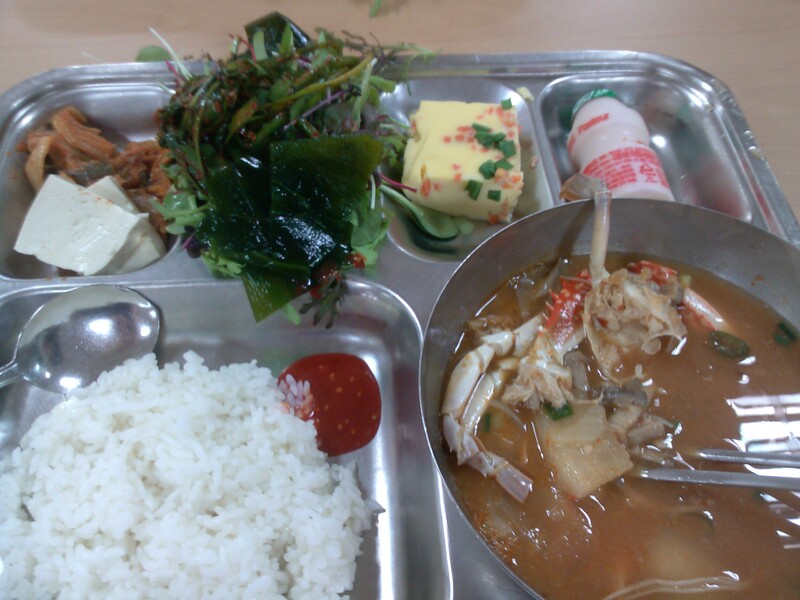 Teacher’s dinner is at 6 p.m.” We ran home, left Mike and Ji Yeon with the unpacking and went to dinner. Dinner was amazing. We had Korean bbq’ed pork, blue crabs, and a million amazing things. They ordered cheap beer for me! 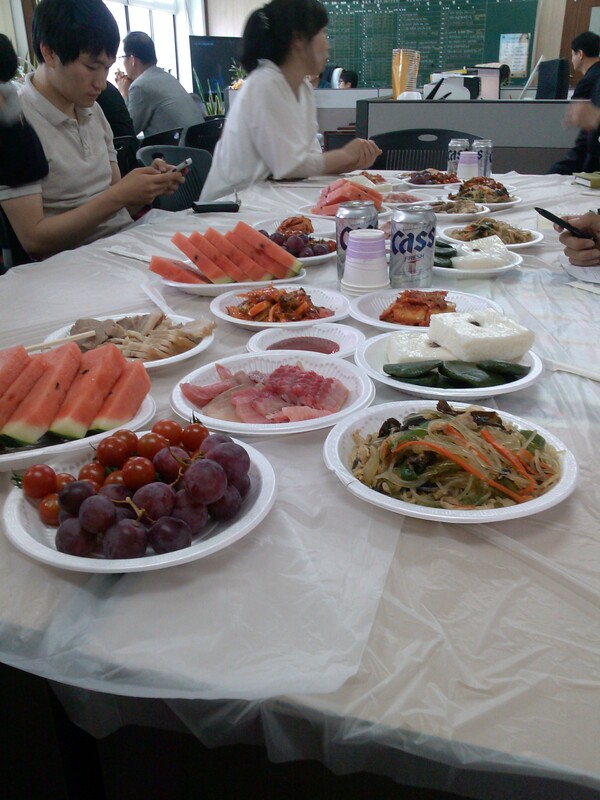 I poured shots for my superiors, was fawned over, and fed amazing food, all while Mike had tofu soup and unpacked. It was a little intimidating, but fabulous. I have the coolest, most enormous and hi-tech classroom I’ve ever seen. VMS people, please show this to Dave so he knows what an ESL classroom should look like jk) My class has 5 tables for 30 children. I have a huge touch screen tv, a bluescreen stage for student presentions, and a mini-English lab with a model stations for play acting. I walk 15 minutes to work every day. Since non- Korean people are super rare here, everybody says hello to me. Some over react when I respond in Korean. I get to school at 8:30, take off my shoes and put on my slippers. Then I go to the teacher’s office with my department and bow to everyone, then I walk to the administrator’s office and bow to the three admins. Next we open our office and get ready. I teach a different schedule every day. I teach 5th and 6th grades. I see each class twice a week. My co-teacher and I teach 50/50 (this is rare.) I also teach Kindergarteners the alphabet and greetings once a week. They are super-duper cute. In addition to regular teaching I am coaching the English speech competition for half an hour after lunch and 20 minutes after school. The competitors are the top five EFLs in the 5th grade. I also give a 10 minute broadcast every Thursday where I make chit-chat and give a riddle each to the primary and intermediate students. This is super fun and I love the students I broadcast with. top row left to right: media board, cameraman, media board, bottom row: controls, me, co-host. My schedule will be shifting all week as my students are pre-paring for their athletic competitions. They have been doing drills all week. The competition is on a Saturday and I think I will go cheer. I forgot to mention how much they love sports. When I arrived at the dinner I was told that a recent CNN report said that “All Americans are fat, but you look physically fit.” The principal plays ping-pong every day in the ping- pong room next to my room. 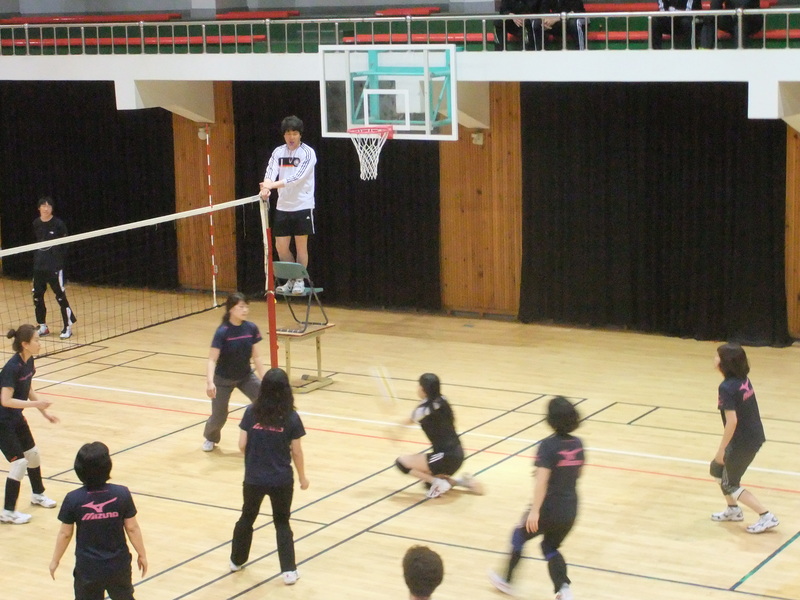 The important people in school play volley ball from 5-7 every school day. Wednesday we had a city-wide elementary school volleyball tournament. The championship is next month in preparation for teacher’s day. A friend is being forced to do calisthenics with his principal for 40 minutes a day. My facilities are very different from any school I’ve known before. My building houses admin, grades 1-6, English, and broadcasting. There is a seperate kinder building, and a seperate cafeteria/ gym building. The gym is on the second floor and doubles as the auditorium. 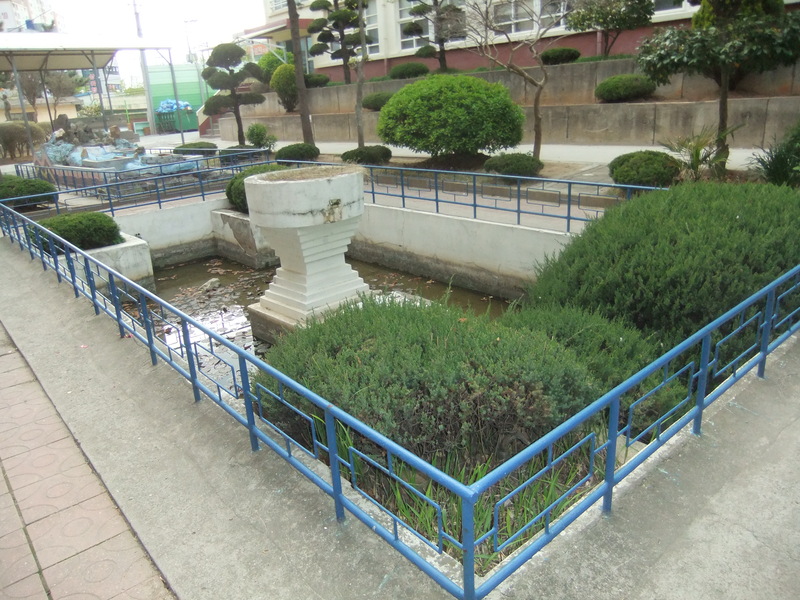 My school has an outdoor Koi pond and a model of the local eco-system that also shows the layers of the earth’s surface and the formation of volcanos. Hello. 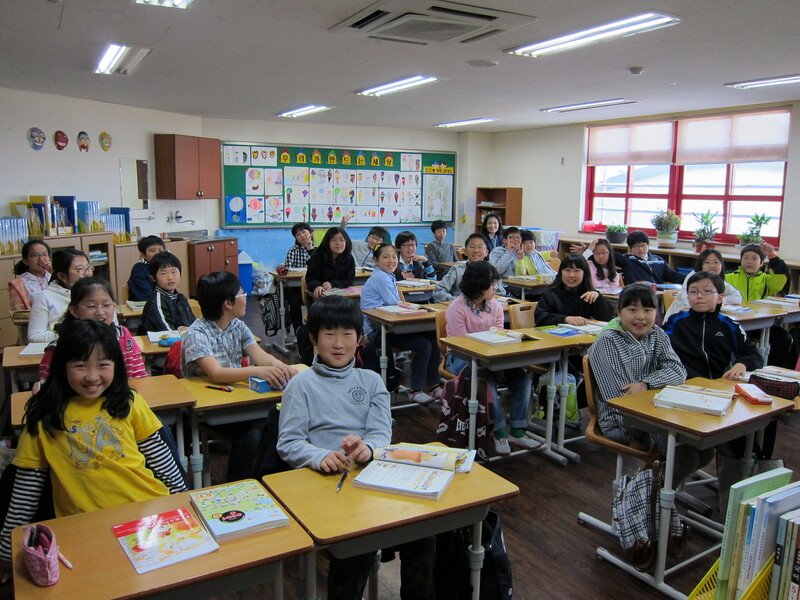 I’m teaching at Seohae Elementary school, just a few blocks from our apartment. My walk is only about five minutes from my building, barely enough time to break a sweat. 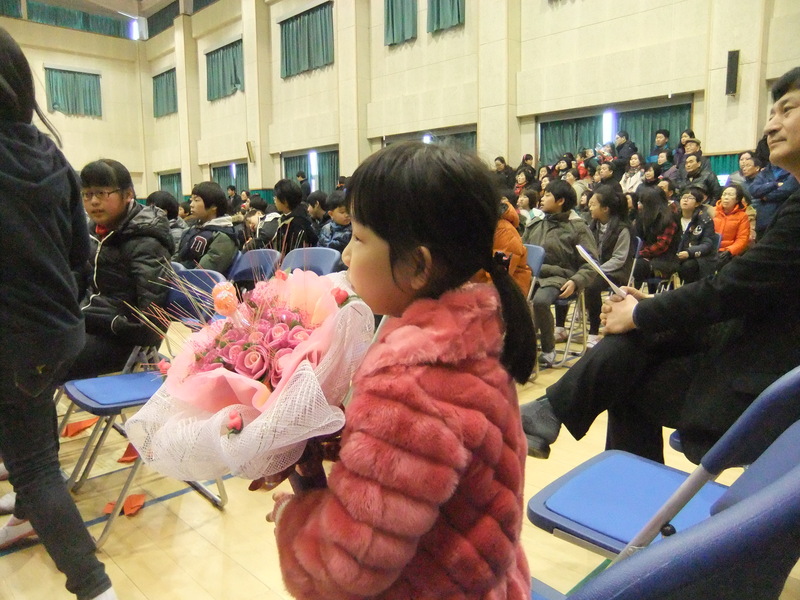 Seohae isn’t as fancy-pants techno-geek as Akasha’s school, but we work just as hard to get the students learning English. I’m going to be teaching 4th, 5th and 6th grades, for a total of about 19 hours week; a workshop for teacher in the school and a ‘special class’ on Monday evenings will fill out my teaching time. 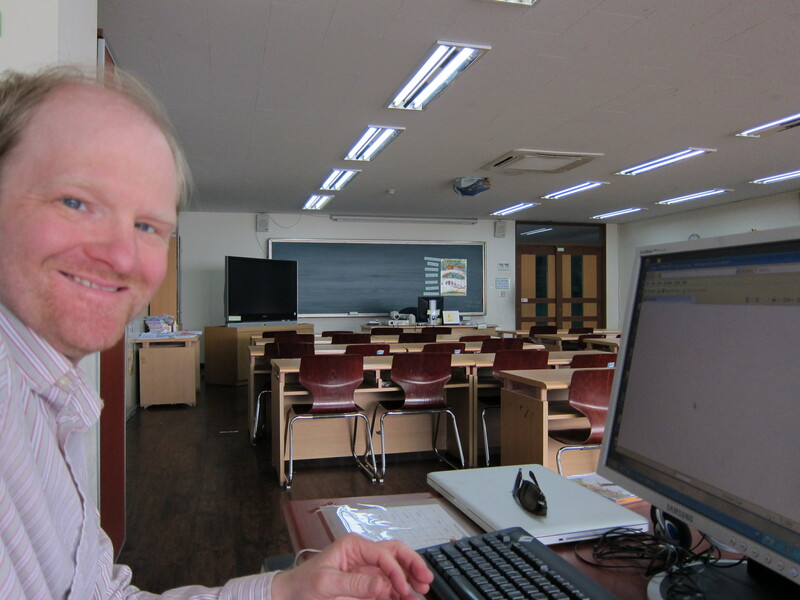 I teach 4th grade with my co-teacher, Ji-yeon, in the English lab, which is also my office. 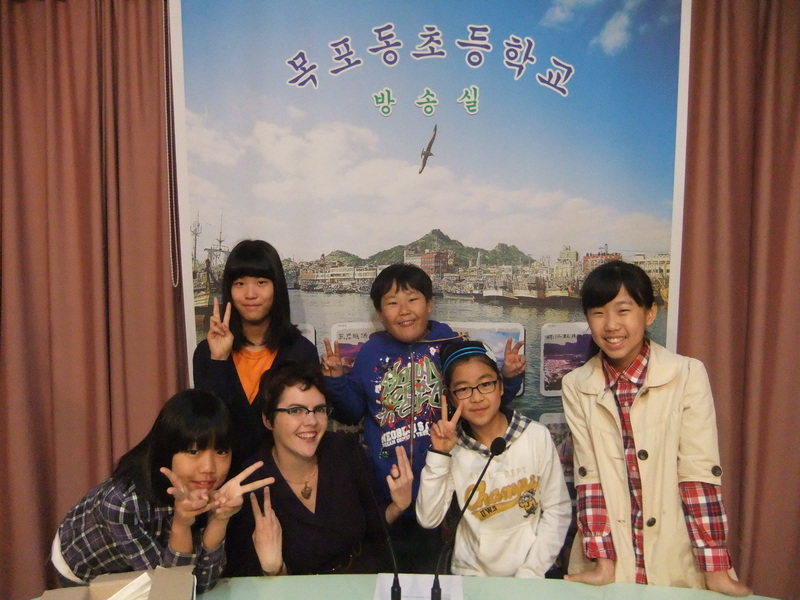 I teach 6th grade with the other English teacher, Mrs. Ok, in the homerooms of each class. For fifth grade, I head out to the teacher’s various home rooms all by myself, and teach all by myself like a real teacher. Unlike Akasha, I’m not expected to bow to the principal every morning, though if I see them, or pretty much any other adult in the halls, I am quick to bow. Bowing, I’ve discovered, is habit forming in this country. The kids are well-behaved, and very curious. I’m often stopped in the halls with calls of “How are You?” and other basic English expressions, and several classes have asked me if I’m related to English soccer star Wayne Rooney. So my days, after giving my introductions, have been filled with lesson planning and trying to fit into a school where I don’t know the language. Everyone has been very helpful so far, and we’re gradually settling in. Well that’s about it for now – thanks for sticking with us to the end of this long, rambling post. We’re thinking about all of you, miss you, and hope you’ll comment, email, Facebook, or Skype us often to keep us in the loop on the happenings of Minnesota, USA, and the rest of the world outside the Korean peninsula. Me again (Akasha) we wake up listening to the evening braodcast of 91.1 MPR and chill out at night while listening to the morning commute music on 89.3 the current. It is funny, except for the Trump politics stuff.